In 1983, Keith Giffen took on a daunting poster for DC Comics. One that featured nearly every character (heroes, villains, substitutes) that had appeared in the Legion's entire history. The picture above is only one-third of the entire image, taken from the right-hand side! I cropped it to this side to show my favorite Legionnaires: Dawnstar, Wildfire, Star Boy, Karate Kid, Mon-El, Cosmic Boy, Lightning Lad, Saturn Girl, and Colossal Boy. Here's the full poster, you can click on it to view the scan. I remember buying this and pouring over the voluminous cast of characters. It could have been blown up and used as wallpaper in order to see all the characters better. 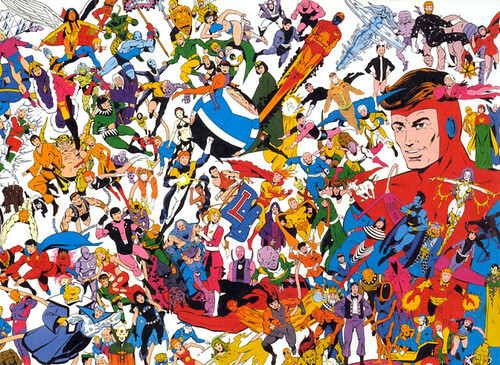 Keith Giffen blew a gasket on this poster, as he said in an interview with Jon B. Cooke (for Jack Kirby Collector #29): "What happened was I did this Legion poster, characters all over the place. And in drawing that Legion poster I totally burned myself out on the book. After the poster I just had to walk away." Giffen's last regular Legion issue (as penciler) with co-creator Paul Levitz was in the Baxter Legion of Super-Heroes #2. He would return to guide the Legion in their infamous "five year later" reboot. Nuff said.